THIS LISTING IS TO BOOK THIS 5 BEDROOM VILLA AND ONLY USE 4 BEDROOM, SLEEPS MAX. 8 GUESTS. THE 5TH BEDROOM IN THIS VILLA WILL NOT ACCESSIBLE OR NOT RENT OUT TO OTHER GUESTS/PARTY. FULL ACCESS OF THE OTHER VILLA FACILITY SUCH AS EXCLUSIVE USE OF LIVING, DINING, GARDEN, POOL (NOT SHARING WITH OTHER GUESTS). STAFF PROPERTY SERVICE AVAILABLE. This villa has five bedrooms and are located in a separate two-storey pavilion overlooking the pool, jacuzzi and beautifully presented tropical gardens. The pavilion consists of two ground floor master suites each with indoor/outdoor ensuite bathrooms complete with stylish solid marble bath, two showers and elegant finishes throughout. The two king size upstairs bedrooms open onto a large balcony with views to the ocean and inviting gentle sea breezes. These beautifully appointed bedrooms are also complimented by spacious stylishly finished ensuite bathrooms. Mood lighting and large flat screen TVs in every bedroom ensure a peaceful, restful holiday. A conversion of the multi purpose room at the villa into a permanent 5th Bedroom with Queen sized bed and all the other facilities as per the other bedrooms at the villa including a large ensuite bathroom. 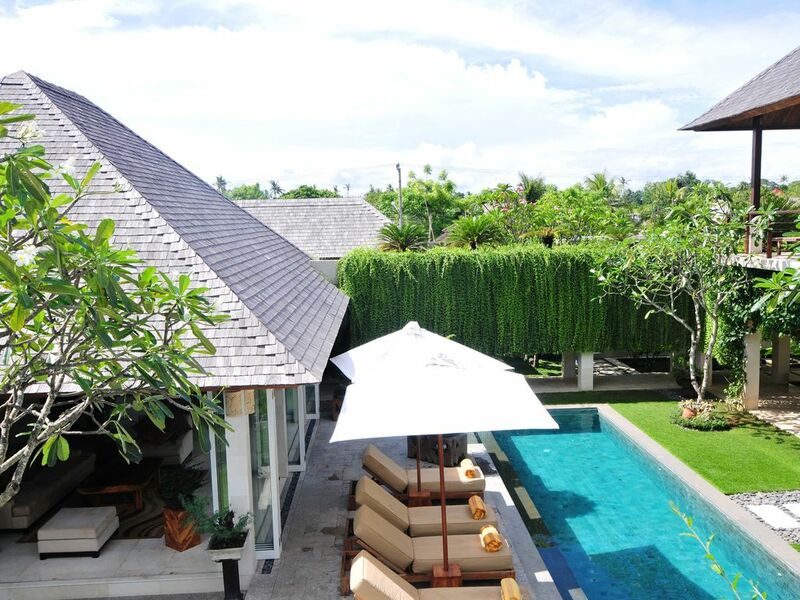 Located a short 250 meters from Batu belig beach, the villa is ideally positioned to start your morning exercise walks along the beach or afternoon stroll to watch the famous Bali sunsets. Other more recent additions to the Bali social scene, Sardines, Metis and Nuris Restaurants are located in the same street as the villa, so as you can see you can maintain your peaceful privacy and yet are within easy reach of first class eating and entertainment experiences.